Words are powerful. 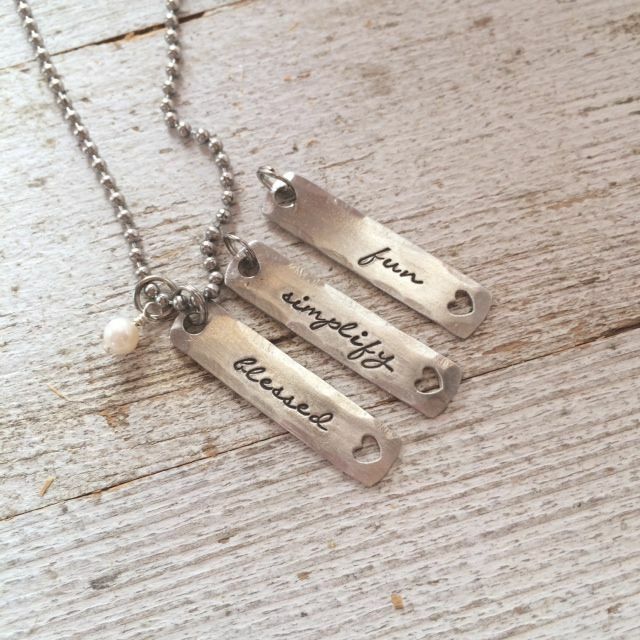 We have a whole business dedicated to word jewelry. A simple word to change your life. Some years the word jumps out and smacks you in the head. Some years you search and contemplate for months to find the right word. This year my word came back around to me over and over, begging to be chosen. Fun. As always, we have a new design for your One Little Word. This year it's called My Heart In a Word. If you haven't chosen a word, or if a word hasn't chosen you yet, here are some suggestions. Maybe one of them will trigger something for you. Have you picked a word? We'd love to hear! Last year my word was Nice: Be. Do. Think. I was thinking of using Nicer for 2016 since I'm not sure I embraced Nice as much as I should have. But Trust is a word that keeps popping up for me. And then there it was, first on your list. It's settled. TRUST is my word for 2016.
less is my word for 2016! My word is Intent(tional). To be more so.